The Planet Jr Cultivator Line is a Philadelphia maker of one-horse farming tools who has undeniably gone beyond the almost insatiable marketplace for small-range farming implements in 1980. S.L. Allen Company continually developed its niche in American Agricultural built-up whose success demonstrated the innate brilliance of Jonathan Robinson and other mid-century creators of tools helpful to farmers. Beginning in the late 1870s, the firm has focused on the recreational gardeners as well as one-horse farmers, thriving as suburbanization gathered force, but ensued later by serving a large group of farmers. During that time, they somehow failed at getting the attention of government researchers to allow themselves to introduce their tools in a wide realm of agriculture. 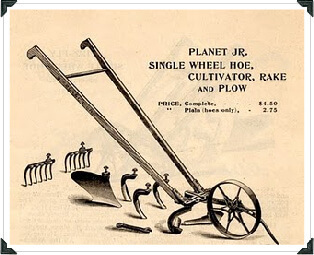 For the better part of its history, the Planet Jr Cultivator firm highlighted its push wheel hoes and automatic seed drills, devices set with all sort of gadgets and practically hard to describe at that time. During then, wheel hoes turn up with one wheel or two: single wheel gear normally ran between rows of foliage and cut off or ripped up weeds on either side. In 1930, the firm has finally completed its project resolving the horseless one-horse farmers. They made the garden tractor which has significantly reduced all needs for horse-powered tools used for land cultivation and also abolished the need for pushed tools as well. The garden tractor, powered by gasoline, had two metal wheels and snapped iron add-ons when it crashed into buried rocks on the ground. It was not until the 1930’s when they felt the need to compete and developed farming tools for the three groups of users: large-scale cultivators, pleasure gardeners, and small-scale farmers. Government researchers have backed the developing firm and gave emphasis on the advantages of wheel hoes on land cultivation. They broke out into an agricultural sphere not just of one-horse cultivators but also of no-horse farmers, half-horse farmers and wheel hoe farmers. They studied the works of the inventors beyond the notice of trade name agricultural science and technology. To learn more about the Hoss Wheel Hoe and other gardening tools visit HossTools.com.